On another rainy, not-quite-winter, night I decided that the fridge needed a little emptying. As we won't be dining at home tomorrow night I wanted to eliminate as much of the remaining leftovers that I could, even after yesterday's assault on all that was both left and over. 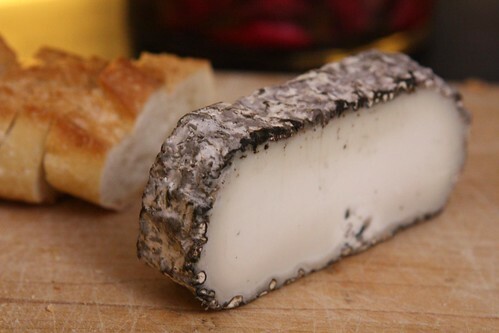 To start off I put out this Montenebro goat cheese from Spain. This cheese is sort of like if they made a giant fist out of cheese then punched you in the face with it then sprayed cracked black pepper into your eyes. I'm not sure from that description if it's clear that I loved this cheese. While that may not sound great to everyone I can assure you that this cheese was incredible. It had a slight grassy taste too. I'm not sure if that's violent enough though. Okay, so after you get pepper sprayed in your eyes it's like someone rubs grass into your brand new white jeans until they stain. This cheese is that good! 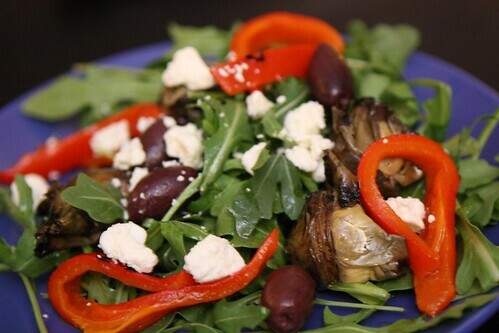 For salad I put together this little number with arugula, feta, kalamata olive, and some grilled artichokes I'd given to Jen for Christmas. I topped it all with a little arugula. I didn't realize until writing this that I didn't put any salt or pepper on this salad. With everything going on it really didn't need any. For the main course I crushed up some pink peppercorns with my mortar and pestle. I trimmed and lightly salted a nice pork tenderloin and then applied the lightly crushed peppercorns like a crust before searing it and throwing it into the oven for about ten minutes. I also baked a sweet potato in the oven and roasted some halved Brussels sprouts to serve along with the pork tenderloin. 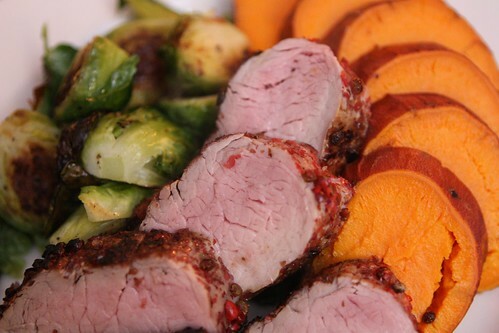 Pork tenderloin is one of my all time favorite cuts of meat and this preparation was a new favorite. 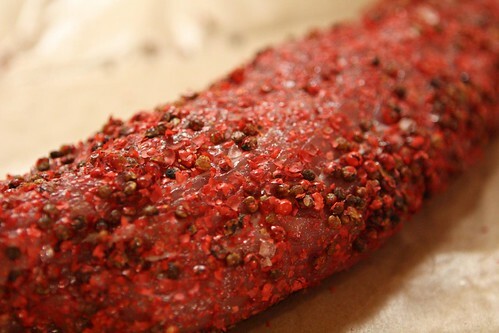 I've never crusted pork with pink peppercorns before but tonight I thought it would be fitting and I was right. The inspiration, I admit, came to me from the beverage I chose to serve. 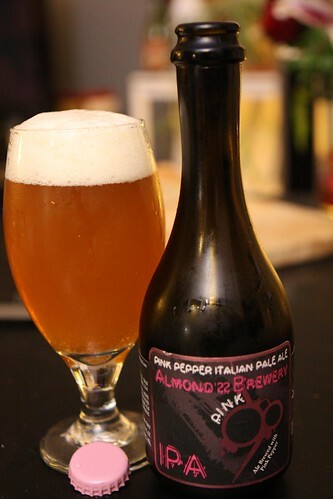 I cracked open this Pink IPA from Birra Almond '22. I'd been looking forward to having this for a while. The Pink IPA is an Italian beer which comes in a beautiful bottle and with a fairly large price tag. It's also an odd volume at 37.5 centiliters (12.7 ounces). I didn't get too much pink peppercorn from this beer. Sadly, to me, it tasted like an average IPA. After eyeballing this one for the past five or six months, observing the packaging, and paying ten dollars for a little more than twelve ounces I was expecting more. Admittedly this was not the freshest bottle on the planet. I would like to give it another try if I could find it fresher. Of course with no dating on the bottle I don't know how I'd really know. So, if you are looking to try a nice single bottle of IPA I'd recommend going with the Rayon Vert last night over this one. It's an astonishingly good beer and it probably costs about a quarter of what this does. Hey, it may not have been the best beer ever but at least the trains ran on time! Pink peppercorn pork looks delicious and I don't even really like pork!